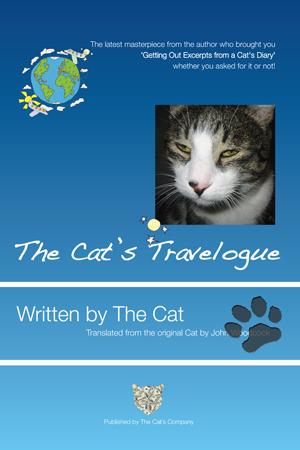 At long last we have stocks of my latest and to date most wonderful masterpiece of feline literature ‘The Cat’s Travelogue’ at my www-WickedlyWonderfulWebsite’s Store. Quite frankly it has taken so long to get stocks because my wonderfully discerning and cuddly readers have been buying my wonderful book just as quickly as it has been printed and rushed to shops in enormous trucks and of course our biggest retailer www.amazon.com. So now you can get your copy of ‘The Cat’s Travelogue’ direct from the wonderful furry author and while reading it imagine I am sitting on your lap, and don’t forget as dear Clint Eastwood says for a few dollars more you can have what we now call the ‘Exclusive’ edition which will be signed by me and by my translator Mr. John Woodcock in one of his lucid moments. So, I have my paws crossed and I’m waiting patiently, hoping that all of my dear cuddly readers know what to do next and won’t disappoint me by not going to www-WickedlyWonderfulWebsite’s Store and buying at least one copy of my marvellous travelogue, if you liked ‘Getting Out Excerpts from a Cat’s Diary’ I have a feeling you are going to love ‘The Cat’s Travelogue’ and if you didn’t, then I don’t mind if you buy a few copies and give it to your least favourite relatives.